Jessica Henning, Director of Operations, started with Northwestern Mutual at the beginning of 2014. Her background includes experience as an assistant director of a tutoring center which began after she earned her degree in English Secondary Education at West Chester University. She has her life, accident, and health license, and she holds her Series 6 and 63 registrations. Jessica helps with overseeing operations, the application process from start to finish, and client account management. Jessica currently resides in New Cumberland with her husband, their daughter, and their dogs. In her free time, she enjoys reading, writing, and watching Audrey Hepburn movies. Works with Financial Representatives and Financial Advisors to develop personal needs and personal planning analysis for each client. Can help develop different analysis including saving for retirement, education and any other major purchases. Zach Weaver is an Associate Wealth Management Advisor and joined the team in 2018. 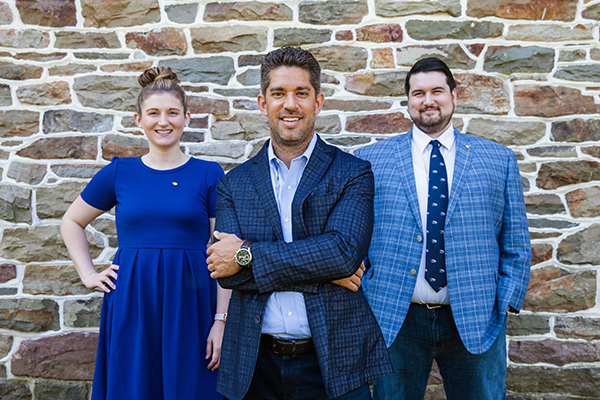 He graduated from Pennsylvania State University with a Bachelor’s in Finance where he was the President of the Finance Club and the Penn State Student Investment Committee. He also has his Life, Accident, and Health Licenses in addition to his Series 7 and Series 66 licenses. Zach helps with financial planning analysis and investment evaluation. In his free time, he enjoys working out, golfing, and reading. Nik Kilmer is an Associate Wealth Management Advisor and joined Jenkins Financial in 2018. He graduated from Pennsylvania State University where he earned his degree in Economics. He was then an intern in Josh's office! He has his life, accident, and health license. He also has his Series 6, Series 63, and Series 7 securities licenses. Nik helps with planning analysis, portfolio evaluation and research, as well as investment operations and service. Nik currently resides in Norristown. In his free time, he enjoys playing golf, watching movies, and following his beloved Philadelphia sports teams. Carly is an associate financial representative and works directly with new advisors on starting and running their practices. She graduated from Lebanon Valley College with a bachelor’s degree in economics and a minor in studio art. Carly also studied actuarial science for a few years at LVC. She was an AFR intern at Northwestern Mutual starting in the summer of 2017 and joined the team full-time in May of 2018. In her free time, Carly enjoys hiking, painting, journaling, and spending time with her friends, family, and boyfriend, Mac.